From May 6-12, we officially recognize nurses for all they do for the greater good of others. Nurses go above and beyond every day of their careers, so giving them a “thank you!” is the least we can do. Let’s all recognize a nurse and send a thank you card this week to give them a well-deserved boost! It only takes a minute to download a thank you card and upload it to your favorite social network such as Facebook or Instagram with the hashtag #ThankaNurse. Nurses display amazing bravery, which often means flashing poise and confidence – and showing enough courage for both the patient and themselves. Nurses are always brave in the face of danger, even when it outsizes them greatly. Nurses work long shifts, many of them work around 12 hours! On top of the long hours, those shifts can be emotionally and physically draining. They’re often on their feet the entire time, and according to one study, the average nurse walks over three miles in one shift. But, nurses do all that while remaining focused on the best care for their patients, and for that they deserve high praise. Nurses are often called the heart of healthcare because they play a big role in supporting, comforting and consoling patients’ family members. They are the first to meet with patients and their family members, the ones keeping family members up to date on a patient’s status and the people sharing information with family caregivers. When it comes to patient care, nurses know that it’s a family affair. Medical settings can be a zoo at times, and nurses can be overlooked. Perhaps a patient or family member only wants to hear from a doctor. If there’s ever a time to give some praise to nurses, it’s during Nurses Week! With all the time spent reading, studying and preparing for exams combined with the blood, sweat and tears of clinical hours, nurses have worked incredibly hard to get where they are today. Whatever nursing degree or training they have, nurses have undergone extensive preparation to reach their position. Nurses continue to work hard, but we should all appreciate the work they have put in to get where they are today. 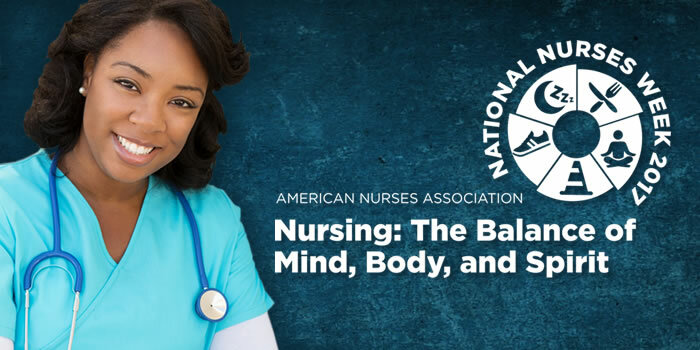 Nurses chose a profession to focus on the wellbeing of others. Their selflessness and sacrifice are undeniable and vital to being a successful nurse. It’s hard to knock a person that dedicates themselves to their work the way nurses do! Nurses are incredible listeners and answer question after question to give the best care they possibly can. Being an active listener shows how much nurses care about each and every patient. Patients, family, and friends will have a LOT of questions, and for good reason: people want to know as much as possible about their loved one’s health. Nurses have, let’s just say, seen some things. It’s impossible to have not witnessed messy conversations or events during their careers. Yet, they are some of the most understanding, unassuming people in the world. Nurses deserve a “thank you” for this reason alone. Nurses make critical decisions every day that can help save a person’s life. They may even be around to perform CPR, help stop bleeding or perform another medical procedure off the clock. Saving lives gets the biggest thank you of them all. Nurses do so much for patients and their loved ones, and deserve appreciation year-round. Don’t forget to send a nurse a thank you card. Happy Nurses Week (May 6-12) and thank you to each and every one of you!